Update and Research from EdgeSpot team: Announcing edgespot.io - a free exploit detection service with cutting-edge techniques! Announcing edgespot.io - a free exploit detection service with cutting-edge techniques! Today, we're excited to announce the general availability (BETA) of edgespot.io - a free exploit detection service with cutting-edge techniques! Today's cyber attacks especially those advanced ones, usually start with an exploit. For instance, the "embedded" malware may run as soon as the user opens an email with an attachment. They may exploit patched vulnerabilities since the fact is that not all users patch their various software in time. Furthermore, they may exploit zero-day vulnerabilities, leaving the victim a "nowhere to go" position. Edgespot.io is specifically built for fighting against those advanced threats. It works like the way of the famous virustotal.com - you upload a file and it tells whether the file is malicious. However, they have huge differences. edgespot.io does NOT rely on or use any other malware or exploit detection engine, it is powered by our own (independent) EdgeLogic exploit analysis engine. edgespot.io does NOT accept "executable" samples (e.g. .exe/.dll), instead, it's developed for detecting client-side exploit samples (for now). The most popular sample types we're currently dealing with are Microsoft Office files (Word, Excel, PowerPoint), PDFs, emails, etc. 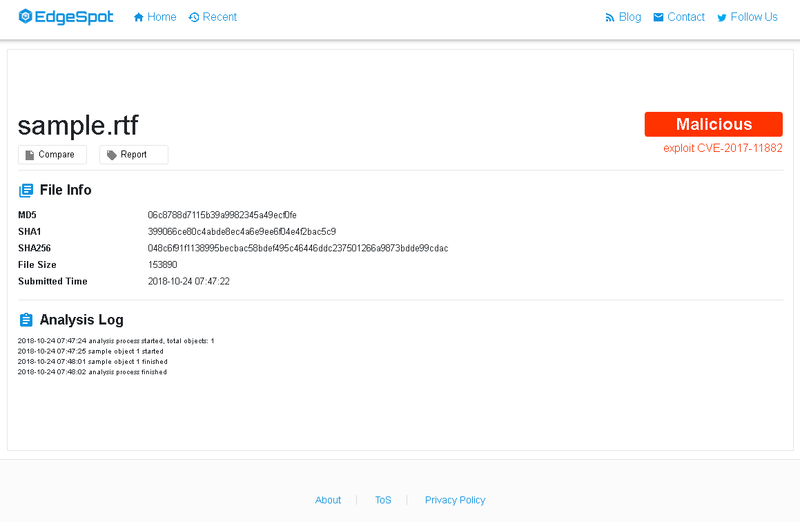 After a file is submitted on edgespot.io, it will be analyzed by our EdgeLogic system, which is an innovative exploit analysis system invented and built by us. The system is powered by various cutting-edge technologies such as machine learning, dynamic and static sample analysis, etc., but most importantly, it's built from a sense of exploit research. Following is a screenshot showing a sample was detected as a CVE-2017-11882 exploit. Please note that comparing to other malware detection service/product, the advantage of edgespot.io is its outstanding capability of detecting unknown or even zero-day exploits! Based on our in-labs tests, the result is very promising. Please do not hesitate to reach us whether via email (contact@edgespot.io) or our contact page or twitter, you're always welcome. Let's work together and make the internet a safer place.